The front of this card has the over flap with golden border, paisley motif base in red and gold having glitter work and a silken tassel. The paste up is made ornate by an image border embossed in pearl and gold combination. The paste up has golden and red border and the Gathbandhan image with the golden paper having gold leaf work and space for the symbol of your choice. 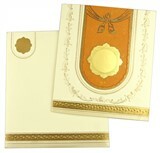 The lower front has embossed golden border design. 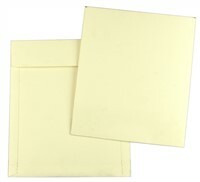 The interleaf has golden borders and the envelope apes the front design. Silk Screen Printing in Orange color.